Glen Hill Farm’s Craig Bernick joined the board of the Thoroughbred Aftercare Alliance, the charitable organization formed to distribute funds to racehorse retirement and retraining facilities that it accredits, in 2013. He has also been cited as a model donor when it comes to retirement, volunteering his time and money to the cause. The TDN’s Sue Finley sat down with Bernick, who now serves on the TAA’s advisory board, during the Keeneland November sales to discuss what a model giver looks like, where the TAA is hitting the mark, and where the organization and the industry could do better. TDN: I’ve been told that you are a model horse owner when it comes to retirement. What does that look like to you and your family, and how should it look to others? CB: I think everybody who puts their hands on a horse, whether they’re a blacksmith, whether they drive a van, work for a feed company, whether they’re a jockey agent, a horse agent, whether they own a farm, whether they work on a farm, their livelihood depends upon the survival of the horse business and the horse industry. And I think the care of horses when they’re no longer, frankly, “of use” for racing or breeding, a lot of those horses have a long time to live and it’s very important for the sake of our industry long-term that we take care of those horses, so I think everybody has to do their part. And I think most horses owners do. We give extra. We give to rescue organizations, we help the TAA in a significant way beyond the mandatory funding, but I think collectively it’s important that people give money. TDN: What do you say to someone who tells you they can’t afford it? CB: I don’t know if somebody can afford to do it. I think there are horse owners who don’t pay their bills. Horse trainers have to pay the feed bill. And if an owner gets 60, 90 days behind that’s huge problem so I’m very sensitive to people who can’t afford to do it. But at the end of the day, we have a sport and a business that all of us would like to see grow, stabilize, be around for a long time, and be something we can be proud of. Someone that makes $25,000 a year shouldn’t give as much as somebody that’s worth millions and millions of dollars, but I think if somebody can give a dollar a week or five dollars a month, that’s 50 or 60 dollars a year. As an industry, we’re all trying to take care of these horses and that’s important, and when people outside the industry hear innuendo that people abuse horses when they’re done racing, or that we don’t feed them, I don’t think that’s true. It’s not true of my horses and it’s not true of people that I know, but the random person on the street may think that because they heard that, it is true. It’s important to have a story, a comprehensive story that shows that this industry does take care of horses no matter how long they’re racing or breeding. I think that people that don’t donate have reasons they don’t donate. They spend huge money, they breed, they pay their bills, they race, they support employees, they pay trainers, they buy seasons and they do a lot of things that help a lot of people in the industry. I can’t really personally argue with that but I make my own choice, because I think the 50,000-foot level of the industry needs this. TDN: It’s obvious why this is important from a moral standpoint. You sound like you’re saying it’s also important from a business standpoint. CB: In our business, we depend upon people buying horses and people gambling on horses. But the only way our business can grow is through handle or through horse purchases and ownership. Our industry needs to attract people with disposable income. We have to rely on people with income to spend, whether they want to bet on horses, own horses or race horses. I think people like owning and betting on a sport that they can be proud of. And I think that’s why as an industry, we have to do this. I think the industry has to get together. It’s the one thing–whether you’re pro-Lasix or anti-Lasix, or whether you race on the East Coast or the West Coast–no matter what you do everybody can agree that we need to take care of these horses and that is why I think the TAA has a lot of legs and everybody agrees it’s a good idea. This is a business problem because of the responsibility we have to the horses. The industry has to take care of those horses. TDN: What does your farm’s participation look like? CB: I was getting requests from rescue organizations. We would have a horse that would get claimed and five years later, somebody would have the horse and they would talk about a dire situation and we would send them $2,000 to pay for some hay or feed until we could find somebody to rescue the horse and then six months later, a different organization would call us about the same horse. I never really knew, to be honest, if it was true or not. I looked at the TAA, which was a new organization at the time, and I thought they could put the money to good use, so our family decided to give a $250,000 pledge to the TAA over five years to use at their discretion and help organizations the way they wanted. That was our initial involvement. Obviously when foals are registered, $25 goes to the TAA. When we race horses at tracks that participate, $5 per start comes out, when we buy and sell horses at public auction, 1/20th of 1% gets deducted to be donated to the TAA. We participate in stallion shares. So at every touch point in the industry, it’s almost a tax, which is not a great word, but it’s a tax on the horse industry and it’s a jump that I accept because I think it’s important for the industry. TDN: Three years in, what are the pros, and what are the cons? CB: The issue that I see is that to get accredited, you have to be an organization that has been in existence for three years, you have to take proper care of your horses and you have to have a safe balance sheet and your money can be accounted for. So we started raising money, accrediting organizations and we started granting money. But as the process has gone on, there are more organizations that qualify, which is a wonderful thing, because we need people to take care of horses, but the TAA’s fundraising, honestly, hasn’t kept pace with the amount of organizations that are being accredited. And if you think about it, when you accredit more organizations, but you’re not raising more money, you can’t give as much money to each, and when you’re not giving as much money, you can’t have the impact on the organizations you’re helping. And the biggest problem is everybody now, through this taxable donation, gives to the TAA, so many rescue organizations aren’t able to raise the money they were previously able to, because their donor base already gives to the TAA. The TAA does amazing work. The accreditation process, all volunteer-based, makes sure every rescue gets visited by veterinarians and TAA inspectors several times. The questionnaire they fill out is huge and then the grants process of how to give out money is taken very, very seriously by the TAA and the way they give out money, the fundamental question is, `where can our money go the furthest to help the most horses?’ which is what I think every stakeholder in the industry wants. So it’s a great model. My fear is that we don’t raise enough money. TDN: You hear a lot of figures kicked about. How much money needs to be raised to get the job done? CB: I think the TAA needs to raise much, much, much, much more money, because everybody knows how good an organization it is, and everybody think it’s a solved problem. The TAA has to be able to grant enough money every year where they can be impactful to the organizations that they’re helping so that those organizations can help enough horses. We need to find a solution. We need to raise enough money where we can help this problem. 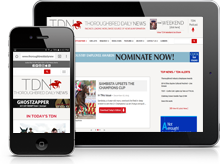 TDN: Is it possible to raise enough money to solve the problem without making the funding mandatory, more than the $25 that is currently required on foal registration? CB: Our industry needs to hold TAA accountable for how it spends the money, and the rescue organizations need to be accountable to TAA. So the TAA has an enormous responsibility and all of us are entrusting our money to them to make sure they do it. I can tell you, there is not enough money currently raised to come close to solving this problem, so I don’t know where people have to give more. I don’t know if they have to give more in every spot. I think when foals are registered and when foals are purchased at auction, people who are going to breed foals, and then people who are going to pinhook foals and make their living in the horse industry, they have to do more of a part than 25 bucks. These people make their living in the horse business. They have to do more than 25 dollars. What the number is? I have some theories. Some people think it would never fly. Some people think it would. And it’s up to the people in the industry to solve that problem. There are always going to be horses that fall through the cracks, but I think if we can create this mechanism where organizations are funded and equipped to take care of horses, I think that’s essentially solving the problem. Once you see the process where a horse can go on and be retrained or if they can’t be retrained, to have a sanctuary to live out their life with other horses, that’s a solution we can all see and be proud of. TDN: You’re now on the TAA Advisory Board. What’s the best advice you can give them? CB: I think the TAA does an absolutely great job with their accreditation and granting process. I don’t think when someone receives an email from the TAA, they stop what they’re doing and start from the top and read to the bottom. I think if we can publicize it, use our accreditation and grants process and show how we spend the money the industry gives us, the impact that that money makes on individual rescue organizations with how they’re able to help more horses, I think that message will speak to stakeholders and horse owners. Everybody will be very proud of the money they have contributed. Then, if we figure out how much money it would take to actually come as close as problem to fixing this problem and show how much money we raise now, then you can have a serious drive to get there and make it every year. I think when we say, `please please please give one 20th of one percent of your auction purchases to the TAA,’ and `please give one-quarter of one season to a horse that breeds 200 seasons a year to the TAA,’ I think everybody says, `okay, I did enough.’ But, you know, the organization does great work, but it doesn’t have enough money to fix this problem. The individual rescue organizations have a harder time raising money from their donors, because everybody thinks the TAA is fixing the problem. And frankly, I think the TAA is a great place to give money because they will incrementally disperse it throughout the industry; they’re a pass-through. But they need to start acting like a business with a job to do rather than a rescue organization. They have a job to do. The industry has given them a job. Everybody donates to spend the money in the best way. I think we do a tremendous job. I think we really do. I think if we publicize that job that we and actually show how we spend the money and why it’s the best investment spend of that money, I think that will speak to horse owners, people that work in the industry, people that own farms and I think that they will get behind giving more money. I think that when you give money to charity, you feel good about giving, you feel like you’ve done your part, but you really don’t know what happens. The best charities communicate with their donors and let them see where their money is spent and the impact it makes.